The ultimate benefit of dynamic simulation is obtained when it is incorporated in the engineering workflow of the plant design, and finally transferred into operation and maintenance in production use. The extent of the applications varies from small computational experiments to models for full-scope training simulators of large industrial systems, e.g. nuclear power plants. The multipurpose nature of Apros is illustrated below. The Apros simulation software provides accurate models even for comprehensive model scope, e.g. an entire production plant. Several types of solvers for thermal hydraulic networks can be used, depending on the demanded fidelity level. By using very short time steps even fast transient phenomena can be studied. Usually the user lets the time step vary based on process conditions. This increases accuracy whenever needed, i.e., during fast transients, but fast calculation during normal, more stable process conditions. A powerful feature is that the simulation run can be continued promptly after any configuration change. Each model configuration can have unlimited number of states (including history data if desired) which make moving to different initial conditions easy. In the Apros modelling environment, the model is regarded as a network of thermal hydraulic nodes, i.e., control volumes, and branches, i.e., connections between the nodes. Calculation level network is created and managed automatically by the process component level, where user operates. The calculation level structure depends on the user given nodalization parameters. The equation solver provides tools for solving large systems of linear equations arising from the discretisation and linearization of partial differential equations with respect to space and time. The innovative Simantics based modelling interface that Apros uses, makes it easy to efficiently configure and change the model configuration, perform simulation experiments, and to visualize the dynamic behavior of the simulated system. Examples of enhanced GUI features are profile monitors for flexible parameter inputting and outputting, coloring of graphics based on model configuration and simulation state (flowing substance, binary signal state, valve opening/closing, etc. ), and versatile trending windows with simulation events. 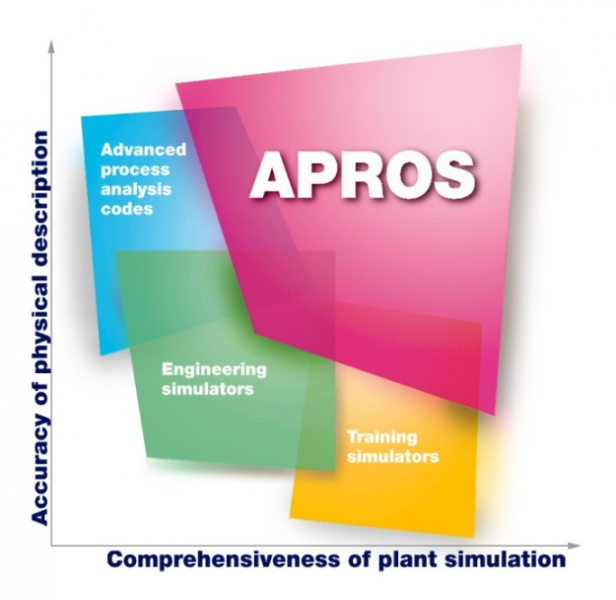 The Apros simulation software is owned and developed by VTT and Fortum.